Chondromalacia is the softening and degeneration of the articular cartilage lining at the posterior aspect of the patella. The development of chondromalacia is thought to be from overuse with repetitive abnormal biomechanics (eg. patellar maltracking) of the knee causing physical wear and tear of the posterior aspect of the patella against the medial and lateral facets of the trochlea. Clarke's sign – pain with quadriceps contraction with pressure applied in a posterior and inferior force. Test may create pain and present positive without chondromalacia and a low specificity at 39%. Established chondromalacia generally has a poor prognosis unless the activity causing pain and damage is addressed. The likelihood of improvement in symptoms depend on the severity of degeneration and the abnormal forces causing the wear and tear of the posterior aspect of the patella. If severe enough, conservative treatment will unlikely improve symptoms and may require more aggressive treatments. Christian SR, Anderson MB, Workman R, Conway WF, Pope TL. Imaging of anterior knee pain. Clin Sports Med 2006; 25(4): 681-702. Gomoll AH, Minas T, Farr J, Cole B. Treatment of chondral defects in the patellofemoral joint. J Knee Surg 2006; 19(4): 285-295. Hudgins TH. Patellofemoral syndrome. In: Essentials of Physical Medicine and Rehabilitation: Musculoskeletal Disorders, Pain, and Rehabilitation. Frontera WR, Silver JK, Rizzo TD (Ed/s). 2nd ed. Philadelphia, PA: Saunders Elsevier; 2008: 371-374. Kusuma S, Lonner JH. 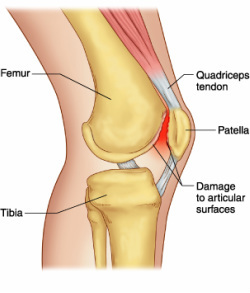 Chondromalacia patella: anterior knee pain in the young patient. In: Lippincott's Primary Care Orthopaedics. Lotke PA, Abboud JA, Ende J (Ed/s). Philadelphia, PA: Wolters Kluwer Health/Lippincott Williams & Wilkins; 2008: 102-103. Malanga GA, Andrus S, Nadler SF, McLean J. Physical examination of the knee: a review of the original test description and scientific validity of common orthopedic tests. Arch Phys Med Rehabil 2003; 84(4): 592-603. Qiu L, Zhang M, Zhang J et al. Chondromalacia patellae treated by warming needle and rehabilitation training: J tradit Chin Med. 2009 Jun;29(2):90-4. Yildiz Y, Aydin T, Sekir U, Cetin C, Ors F, Alp Kalyon T. Relation between isokinetic muscle strength and functional capacity in recreational athletes with chondromalacia patellae. Br J Sports Med 2003; 37(6): 475-479.